Winter Aurora Package ( NOV 10, 2018 – APR 30, 2019 - Daily departure ) Take in, two or three nights of spectacular Aurora viewing. The package includes airport pickup and departure from your hotel and tour transportation. Yellowknife Aurora Capital of Canada Yellowknife, the capital of Canada’s Northwest Territories, is located directly under the Aurora Oval, a narrow band circling the polar reaches of the globe in which the mysterious green light of the Aurora Borealis is at its most brilliant. Combined with its clear cold nights, Yellowknife’s favorable geographic location consistently makes it one of the best places in the world for Aurora viewing. From our cabin, which is located a few kilometers out of town far from man-made light, our guests enjoy spectacular displays, pulsing and shimmering dramatically across the night sky. The Aurora Borealis, also known as the Northern Lights, are giant electrical storms formed by solar flares from the sun reacting with the earth’s magnetic field. Even though they are usually 100 - 500 kilometers above the earth’s upper atmosphere, our guests often feel like they can reach out and touch them. We travel with you by snowmobile to Great Slave Lake,This lake is one of the world’s largest fresh-water bodies of water. 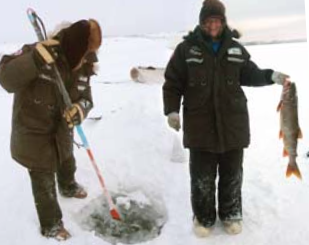 Aside from the natural beauty of the Aurora Borealis,where you will observe our guides pull up the catch with an aboriginal ice fishing net..Then,return to our lodge and enjoy a feast of freshly caught fish. After lunch, We will have a city tour to this capital city of the Northwest Territories. 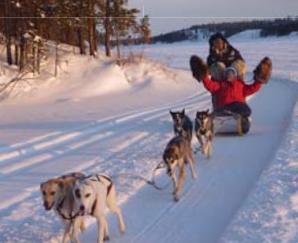 Yellowknife is a small-but unique town of about 18,000 people , you will experience your own unique adventure in our pristine Northern environment. Tonight, we will have the 2nd Aurora Viewing tour. Experience the world class dry land training and the power of a professional team of sled bogs. Optional activities are available to choose from, the 3rd Aurora Viewing tour will be arranged at night..
Free at leisure till transfer- to airport for your returning flight. * Deluxe Hotels, Bus and Chinese English Speaking Tour Guide. Package not including: Optional tours , Air ticket , Travel insurance and Gratuities, etc.